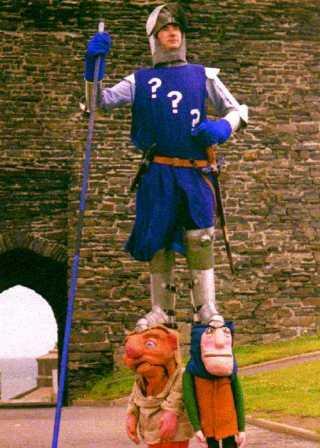 A medieval Stilt Walker with a difference. Sir Lupin of Pipwithers is a Knight in Armour who has lost his horse and so must be carried on the heads of his unfaithful peasants, Bleare and Bloutte. Standing nine feet high and wearing real metal armour - Sir Lupin astounds and delights the public in his quest for Shergar, while his peasants mutter and occasionally revolt. 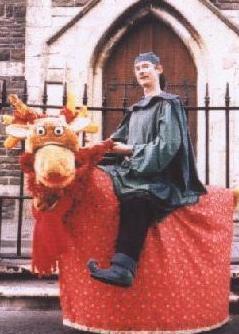 Tony Heales is the creator of Living Daylights, specialising in puppet making, workshops and walkabout characters. Available all year round, for corporate events, christmas parades, lights switch on, medieval events, schools, colleges, etc.